Carla Valasquez: Attends Codman AcademyCarla Velasquez, an eleventh grader at Codman Academy Charter Public School, won first place in the August Wilson Monologue Competition earlier this month, earning a trip to the national competition in New York City in May. Velasquez, a 17-year-old Mattapan resident, began performing after competing in a Poetry Out Loud competition in the ninth grade. She has since involved herself in theatre by participating in summer plays and performances in her community. Her performance opportunities have been frequent due to the partnership of Dorchester’s Codman Academy Charter Public School with the Huntington Theatre Co. The two institutions have worked together since 2001 to provide a humanities program that combines theatrical arts with language and literacy. During her ninth and tenth grade years, Carla and her classmates participated in Huntington’s bi-weekly acting classes. The annual monologue competition is dedicated to August Wilson, a Pulitzer Prize and Tony Award winning playwright who began working with the Huntington Theatre Co. in 1986. There he developed several works in “Century Cycle,” a group of ten plays chronicling the 20th century African-American experience. Velasquez appreciates the similarity of the Cycle plays to her own life and to African American teenagers in her community. “I love that the stories that August Wilson brings to light are still alive today,” she said in an interview. In taking first place, Velasquez chose to bring to life the monologue of Vera, a character from Wilson’s “Seven Guitars.” She chose the monologue because she wanted to speak to the heartbroken people she has met. “I see so much of my friends getting their hearts broken and so much heartbreak going on with girls my age,” she said. Carla is already making decisions about her artistic future. 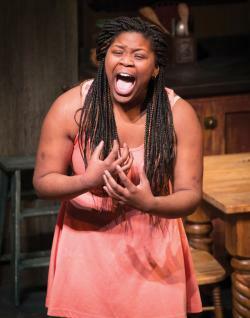 She wants to continue performing in college and plans to minor in acting. She is interested in majoring in athletic training or physical therapy at Ithaca College or University of Massachusetts Amherst. Codman Academy and her peers have been supportive of her soon-to-come performance on Broadway. “They’re giving me what I need to succeed in this competition,” she said. In the May event, Velasquez will compete alongside fellow finalists Maria Gonzalez and Joshua Champagne at August Wilson Theatre on Bioadway. The event is free and open to the public.